Shown above: 1 St. Tropez Sofa, 2 Club Chairs, and 1 Ottoman. 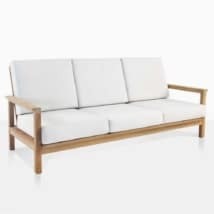 Expansive, uncomplicated and effortless; the St. Tropez Teak Outdoor Furniture Collection is a staple item at Teak Warehouse. Walking the line between modern and traditional, with style and grace, the St Tropez is ultimately a classic collection. Featuring a balmy style with simple, clean lines resulting in an all round timeless feel. Sleek pieces of Grade A Teak paired up with Sunbrella® cushions, shown here in Canvas, create a comfortable and elegant seating collection. Named after the famous French seaside town which continues to allure people with its wealth of culture and relaxing environment. 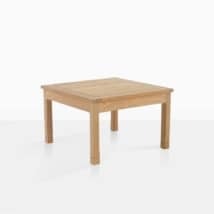 Transpose those qualities into the St. Tropez Teak Outdoor Furniture Collection and you now have 6 pieces of fabulous furniture all with quality craftsmanship and divine details. 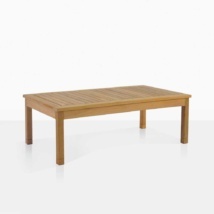 The design features smooth sections of teak within a superbly simple frame, elaborated with a light flare out on the ends of the arm pieces, ideal for placing a small glass or for simply having a comfortable place to rest your arm! 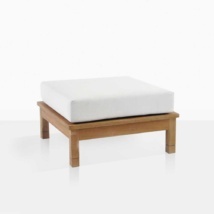 Each piece also includes a slight carved detail on the legs. All features that make the St Tropez stand out from the crowd. 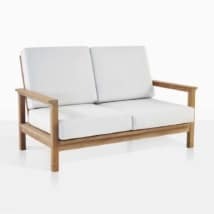 The St. Tropez Teak Outdoor Furniture Collection features the sumptuous Sofa, charming Loveseat, comfy Club Chairs, Ottoman, Side Table and the elegant Coffee Table. Take as many pieces as you wish to create a perfect slice of paradise in your very own backyard! The St. Tropez Teak Outdoor Furniture Collection is constructed from the durable, attractive and sturdy A-Grade Teak; our signature at Teak Warehouse because of its high levels of natural rubber and oil content, and fixed with marine grade glues and 316 Stainless Steel, topping off the look are amazing Sunbrella® cushions which we can custom color for you or choose from our chic in-store colors: Canvas, Taupe or Coal! 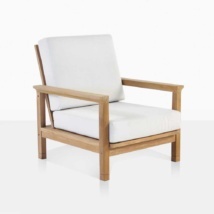 The St. Tropez Teak Outdoor Furniture Collection includes FREE Sunbrella® cushions!